I did some digging in AdDuplex stats and I’m happy to report that, at least according to our stats, the number of Windows Phone users has more than doubled since June 2011. That said it’s also noticeable that the number hasn’t changed much since September. That can be easily attributed to people waiting for the new 2nd generation hardware. Hopefully we will see a new spike in the numbers in the next couple of months. We have the data for unique users that saw at least one AdDuplex ad in each app participating in the network on a particular day. I’ve discarded Top 5 apps by this criteria and all apps with less then 10 users. 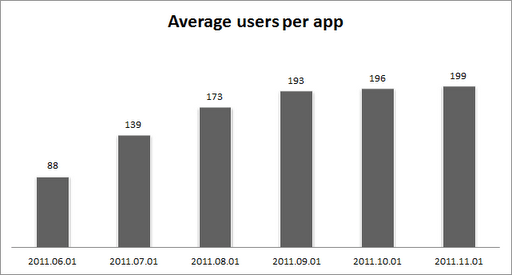 The numbers above are the averages for the remaining apps.